Castle Class 4-6-0 5043 Earl of Mount Edgcumbe drifts almost silently past Chilson on 27 August 2016 with the Vintage Trains 1Z53 08:27 Tyseley to Oxford 'Summer At The Palace' railtour. 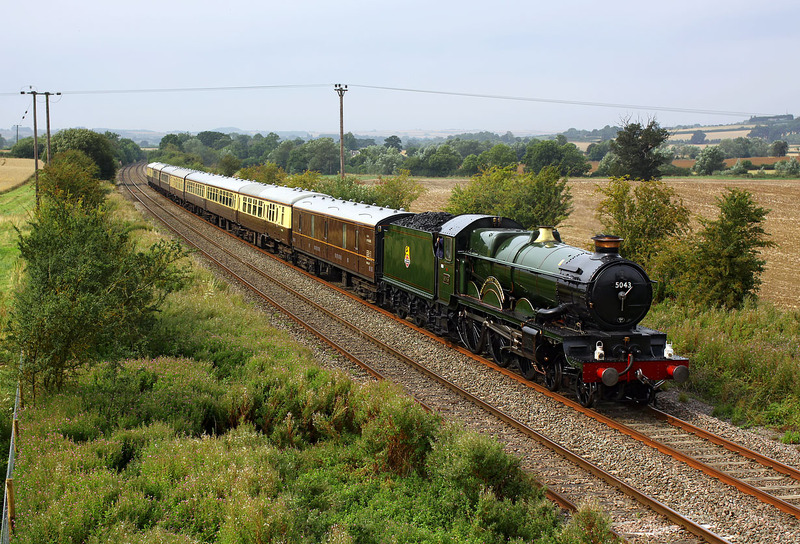 Just 20 minutes earlier, the modern version of the Great Western green livery passed by, in the form of 166205. I was surprised top be the only person at this location, especially as it is one of the better spots on the Cotswold Line with regard to the light angle. The train passed in the very last of the morning's weak sunshine. The advancing cloud heralded the arrival of bad weather, with the West Oxfordshire area experiencing one of the most ferocious thunderstorms in many years later in the afternoon.